Japanese Folktales : The Mirror of Matsuyama (Cerita Rakyat Jepang : Cermin Matsuyama) - Ada pepatah tua mengatakan, semakin banyak kita mendengar cerita rakayat dari suatu daerah, semakin bijak kita menanggapi suatu permasalahan. Sadar atau tidak, cerita rakyat atau folktales diciptakan untuk membuat bijak pendengarnya. Untuk memperkaya wawasan kita mengenai cerita rakyat dari berbagai negara, penulis hadirkan Cerita Rakyat (Folktales) Bahasa Inggris Se-Dunia, yang pada kesempatan kali ini penulis hadirkan cerita rakyat dari jepang tentang The Mirror of Matsuyama. In ancient days there lived in a remote part of Japan a man and his wife, and they were blessed with a little girl, who was the pet and idol of her parents. On one occasion the man was called away on business in distant Kyoto. Before he went he told his daughter that if she were good and dutiful to her mother he would bring her back a present she would prize very highly. Then the good man took his departure, mother and daughter watching him go. At last he returned to his home, and after his wife and child had taken off his large hat and sandals he sat down upon the white mats and opened a bamboo basket, watching the eager gaze of his little child. He took out a wonderful doll and a lacquer box of cakes and put them into her outstretched hands. Once more he dived into his basket, and presented his wife with a metal mirror. Its convex surface shone brightly, while upon its back there was a design of pine trees and storks. The good man's wife had never seen a mirror before, and on gazing into it she was under the impression that another woman looked out upon her as she gazed with growing wonder. 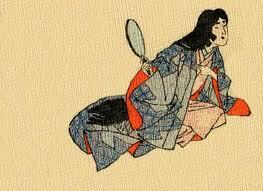 Her husband explained the mystery and bade her take great care of the mirror. Not long after this happy homecoming and distribution of presents the woman became very ill. Just before she died she called to her little daughter, and said: "Dear child, when I am dead take every care of your father. You will miss me when I have left you. But take this mirror, and when you feel most lonely look into it and you will always see me." Having said these words she passed away. In due time the man married again, and his wife was not at all kind to her stepdaughter. But the little one, remembering her mother's words, would retire to a corner and eagerly look into the mirror, where it seemed to her that she saw her dear mother's face, not drawn in pain as she had seen it on her deathbed, but young and beautiful. One day this child's stepmother chanced to see her crouching in a corner over an object she could not quite see, murmuring to herself. This ignorant woman, who detested the child and believed that her stepdaughter detested her in return, fancied that this little one was performing some strange magical art--perhaps making an image and sticking pins into it. Full of these notions, the stepmother went to her husband and told him that his wicked child was doing her best to kill her by witchcraft. When the master of the house had listened to this extraordinary recital he went straight to his daughter's room. He took her by surprise, and immediately the girl saw him she slipped the mirror into her sleeve. For the first time her doting father grew angry, and he feared that there was, after all, truth in what his wife had told him, and he repeated her tale forthwith. When his daughter had heard this unjust accusation she was amazed at her father's words, and she told him that she loved him far too well ever to attempt or wish to kill his wife, who she knew was dear to him. "What have you hidden in your sleeve?" said her father, only half convinced and still much puzzled. "The mirror you gave my mother, and which she on her deathbed gave to me. Every time I look into its shining surface I see the face of my dear mother, young and beautiful. When my heart aches--and oh! it has ached so much lately--I take out the mirror, and mother's face, with sweet, kind smile, brings me peace, and helps me to bear hard words and cross looks." Then the man understood and loved his child the more for her filial piety. Even the girl's stepmother, when she knew what had really taken place, was ashamed and asked forgiveness. And this child, who believed she had seen her mother's face in the mirror, forgave, and trouble forever departed from the home. Lihat juga Cerita Rakyat Bahasa Inggris Se-Dunia yang lainnya.